Synopsis : Going the Extra Mile experiment highlights accessibility issues revealing how hard it is for disabled passengers to navigate the London public transport system. 1: Transport staff are often unprepared to offer assistance. 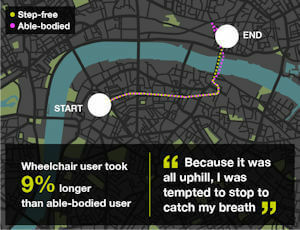 2: On average a London wheelchair users' commute takes 49% longer than an able-bodied person's. 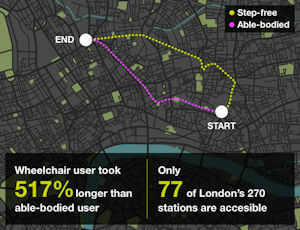 3: Shocking 71% of London tube stations not fully accessible. 4: Disabled public transport users don't feel official apps or planners cater to their needs. In an effort to highlight accessibility issues, a new travel experiment sent wheelchair users and able-bodied people on five of the busiest London commute routes, revealing just how hard it is for disabled passengers to navigate the public transport system. Longer commutes and restricted access to the transport network: With only 77 out of 270 stations fully accessible, wheelchair users' commutes took 49% longer than those of able bodied participants. Planning is an exhausting challenge: Users stated official transport apps are both unreliable and inaccurate. From using Citymapper to plan journeys and Google Maps satellite to determine the state of pavements, transport apps are not reliable for wheelchair users. Paved with obstacles: Wheelchair users encountered countless unforeseen obstacles along the way, from unhelpful transport staff, lack of staff assistance and difficult transfers at bus stations such as uneven terrain or uphill transfers. It's the busiest commuter city not only in the UK but also in Europe, with 1.3 million journeys made by people with disabilities in London every day. Although the Mayor of London website states accessibility on London's public transport is one of the best in the country, disabled users paint a dire picture. Specialist solicitors Bolt Burdon Kemp conducted a travel experiment on London's busiest commute routes to reveal just how hard it is to navigate the capital's transport system. 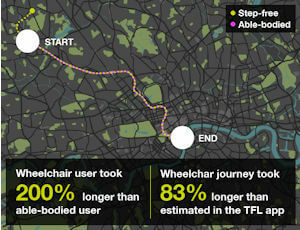 The 'Going the Extra Mile' experiment enlisted the help of five wheelchair users who tested five popular commuter journeys in London. The study pitted wheelchair users and able-bodied commuters against each other, with each starting their journey from the same point, at the same time and finishing at the same destination. The experiment was carried out in an effort to raise awareness of accessibility issues on public transport. With only 77 out of 270 stations fully accessible for wheelchair users, London's transport options are often very limited for people with disabilities, making their journeys longer and filled with challenges. 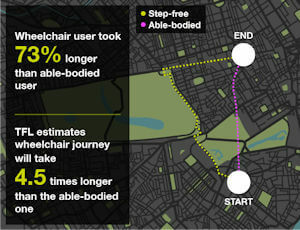 The five commuter journeys carried out during the course of this experiment took wheelchair users a combined total of 3 hours and 5 minutes to complete - 49% longer than able-bodied participants. A simple 9-minute commute from Liverpool Street to Kings Cross took an astounding 32 minutes for the wheelchair user, whose only option was taking a single bus route - bus 205, between the two central London stations, due to the lack of accessibility of the underground. "Today was the first time I'd used public transport since [getting injured]. I probably won't use it again". Despite living close to 5 underground stations, Karl, another participant, revealed he is limited to using buses 90% of the time, a less than ideal scenario as "buses are unpredictable so it can get really difficult". Travelling from Victoria to Oxford Circus - a journey that can take a mere 4 minutes for an able-bodied person - took Karl 73% longer because he had to use a bus route instead. "I usually use Citymapper to plan my journeys," reveals Karl, "but I tend not to rely on it". 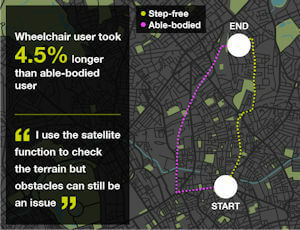 Other wheelchair users disclose the meticulous work involved in planning a journey: "I use Google Maps' satellite function to determine the state of the pavement I'd need to take" and the unforeseen obstacles that can frustrate them and delay their journeys: "If the bus stops at an awkward place, it can be a struggle wheeling up". What is more, official apps and tools consistently fail to cater to wheelchair users' individual needs. For the Westminster bound journey, the TFL journey planner suggested a change at Finchley Road to use the Jubilee line, in a similar manner to the able-bodied passenger. In reality, staff at the starting point of the journey advised this was not possible, as the gap there would be far too large for an electric wheelchair. It transpired that the route recommended by the journey planner would have only worked for a manual wheelchair user, potentially leaving any electronic wheelchair users stranded had they taken the recommended route. Transport staff are often unprepared to offer assistance. One participant was left waiting on a bus arriving at King's Cross station, as the driver closed the doors before she could exit using the ramp. She disclosed some bus drivers have difficulty activating the ramp: "It sounds ridiculous, but sometimes the driver might even ask me for guidance on how to activate it! On the Westminster bound journey, Jennifer, the wheelchair user doing the experiment, faced an unexpected challenge, as there was no staff present to assist with setting up a ramp at the destination, despite assurance from the information point that this had been arranged for her. This left Jennifer with only one option: relying on help from a stranger to exit and navigate the station. Difficult transfers are another prevalent issue. To get to the London Bridge bus station from the London Bridge underground station, the wheelchair user needed to traverse an entirely uphill transfer. "I'm a very active wheelchair user, but even I was tempted to stop for a minute to catch my breath", revealed Sau, who took part in the experiment. These are only a few of the dreadful obstacles wheelchair users face on a regular basis on their London public transport journeys. We must bring attention to these facts, as there's so much more that can be done to make public transport more accessible, reliable and pleasant for wheelchair users. *News Release by Bolt Burdon Kemp: Disabled World makes no warranties or representations in connection therewith. PR content may be edited for style, clarity, and/or length. If you are connected with this page and want it corrected/updated please contact us.